How can something so simple taste so delicious? That is how I feel about cucumber salad. Cucumber, often overlooked or used as a garnish, is the highlight in this simple summer salad. Fresh from the garden cucumbers, tomatoes and chives make it even better. After a long, hot and humid day, this salad hits the spot! This night I used a coconut vinegar because my meal was centered around coconut, but feel free to use any vinegar you like! Mix the vinegar, oil and honey together. 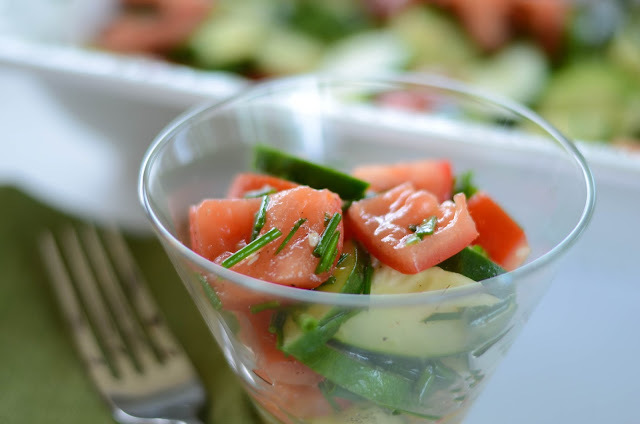 In a large bowl, mix the cucumber, tomato and chives. Add the dressing, and then salt and pepper to taste. Make sure you fold the dressing into the vegetables. Cover with wrap and the allow to refrigerate at least four hours, or preferably overnight. Every so so often, stir the mixture.